The Ministry of Artistic Affairs: Case Study: Newfoundland: the world's wildest arts scene? 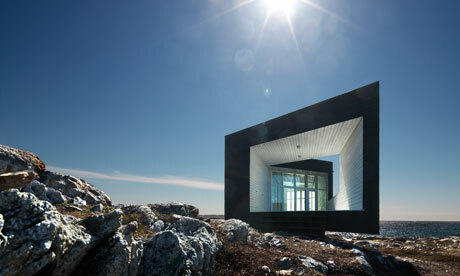 Case Study: Newfoundland: the world's wildest arts scene? Fogo, Newfoundland: the world's wildest arts scene? A dramatic community project is transforming a windswept island of fishermen off Canada's Newfoundland coast into a cutting edge artists' haven. A 110-square-mile, windswept outcrop of bald rock overlooking the raging north Atlantic, off Newfoundland, Fogo is home to 2,700 fishermen or descendants of, and a considerably larger population of gannets whose shrill cries provide a constant soundtrack. This is life right on the edge. Indeed the Flat Earth Society considers Fogo Island one of the four corners of a flat earth. It's also the least likely place you'd think of finding members of a cutting-edge international art scene. But that's exactly who's coming to Fogo now. By all accounts, traffic should be going in the other direction: for centuries the inhabitants of Fogo lived between wind and waves in search of cod – until a 1992 cod moratorium strangled their livelihood and the small island suffered as the population moved away. But that's forgetting the enterprising nature and deep sense of home of Fogo's people. And the equally deep pockets of one islander – a dot.com success story who came back with an experiment to give Fogo a future, by using its past. Zita Cobb, who left Fogo in 1979, returned a multimillionaire in 2006 after helping California-based JDS Uniphrase become a world leader in fibre-optics during the high-tech boom. Cobb and her brother established the Shorefast Foundation with the idea of revitalising the community by weaving together the fundamental components of Fogo's heritage – fishing, craftsmanship, nature and tourism. Shorefast put $6m into the project, the federal and provincial governments $5m each. First, Shorefast planned to put Fogo on the map as an international art destination, and hired Newfoundland-born, Norway-based architect Todd Saunders to design a series of artists' studios. Four of them were finished last year, three more were unveiled on 23 June. Each studio is completely off grid. Scattered over the island, the ultra-modern constructs are jarring and dramatic blades of volcanic stone built on rock, perched seemingly precariously over the water. While radically different in appearance from Fogo's weather-beaten clapboard houses, in subtle, abstract ways they have a relationship with them. Both are built on stilts over the water and seem to cling to the shore like their life depends on it. Each artist's studio is located in an island community – or outport as Newfoundlanders call the coastal settlements too small to be a village – such as Joe Batt's Arm, Tilting or Seldom, and visiting artists, chosen by Shorefast will embark on projects which will benefit the community. Elisabet Gunnarsdottir, an Icelander hired by Cobb to lead the Fogo Island Arts Corporation (artscorpfogoisland.ca), says that Shorefast is guided by principles of geo-tourism. "We want to engage the community. We are trying to create a tourist destination that sustains the character of Fogo, its aesthetic, heritage, and the economic wellbeing of the residents." For that they'll need tourists. 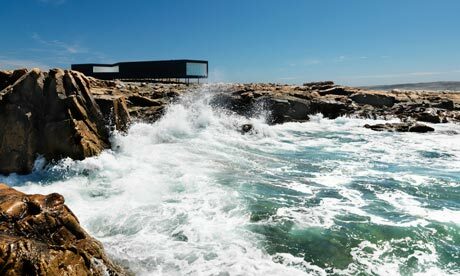 Enter the second component of Cobb's project: the Fogo Island Inn, a luxury hotel. The five-star modernist inn, also designed by Saunders, will have 29 oceanfront rooms when it opens in June 2012. It will also feature a spa, heritage library and art gallery. Cobb says all profits will be reinvested into the community. The inn will be filled with handmade items that reflect the character of Fogo. Guests will wake up in beds covered in quilts befitting Fogo's long tradition of community quilters. The inn's interiors are by London-based Ilse Crawford – former Elle Decoration editor and the designer behind interiors including Soho House New York and the restaurant at the Grand Hotel Stockholm – again with local materials and designs inspired by traditional ideas. At $400 a night the inn is targeting a weathly, niche clientele. But there are less pricey accommodation options too. The Quintal house, an 1840s fisherman's house has just been renovated and transformed into a three-room B&B by Nadine Decker (+1 709-658·7829, quintalhouse.ca, doubles from $115). If you're on the island in late July, a must see is the Great Fogo Island Punt Race to There and Back, a project to revitalise the once ubiquitous all wood punts, which is organised by Nadine Decker's uncle Pete. Local boaters row through rough open waters 10 miles and back to Change Island. In the backdrop you might be able to see remnants of the spectacular parade of icebergs and ice floe heading south in the spring. Visitors can also photograph the rotund Atlantic puffin that land on the island in June. And hike the Turpin's Trail, a five-mile route that starts at a sandy beach, and ends at Tilting, an Irish heritage village or go partridgeberry picking with Pauline Brown who organises the Fogo Island Partridgeberry Harvest Festival. Some might be happy just trying a scoop of partridgeberry ice-cream from Growler's Ice Cream (125 Main Road, Joe Batt's Arm). Or chowder and chatter at Nicole's Cafe next to Quintal House. And visitors can also bear witness to the slow comeback of the fishing industry thanks to the Fogo Island Cod Pod, a newly sustainable method of baited fishing. Travelling to Fogo requires will and time. The easiest way to get there is a flight to Gander, which was once one of the largest airports in the world where every transatlantic flight used to refuel. It's then a one-hour drive on a motorway, stretches of which might be blocked by moose, until you reach the aptly named town of Farewell. Then it's a one-hour ferry crossing. But those who make the trek will be rewarded with a unique place and unique people and a new tourism industry that could possibly be a model for other small, endangered communities. By Karen Burshtein for The Guardian.